We recently reported a case of the first oriental artist to be influenced by Alzheimer’s disease (AD) . In this report, a Chinese master of painting, born in 1929, was diagnosed of AD and his painting style changed remarkably after he developed AD. He used to be known for the realistic renderings of natural objects, such as flowers and birds. At about the age of 77 years, he was noted of depression and eventually stopped painting completely. In the following evaluation, his IADL deteriorated gradually and dementia of Alzheimer’s type was diagnosed. It was amazing that one and a half later, he resumed brush painting and the painting style seemed to have a dramatic change. With the progressive deterioration of the cognitive function he changed his style: the reduction in spatial ability, the traits became fewer complexes, the color darker, the scene less luminous, and the contours of individual objects less precise. In fact, being famous for the realistic representations of natural objects such as flowers and birds, his artworks after the dementia represented another topic, the scene series. In the previous report in Cortex , we showed only the series of the flowers. However, we considered it more impressive for the scene series and thus we selected some works of the latter and presented them here (Figure A-C). The works here are presented with the progression of the dementia. Figure 1: Progression of the dementia. Considering the rarity of similar cases, our case may be the first to present the world of Alzheimer’s disease in a unique way and with the most complete records. However, interpreting the meaning of artworks involves the risk of over interpretation because of the creative artistic style. We are now attempting to analyze these paintings in a more objective manner, simultaneously attempting to compare our case with five other reported cases to sketch the inner world of Alzheimer’s disease [2-6]. Given that patients with dementia gradually lose their oral presentation ability, artists with dementia who continue to paint may represent a door to the world of Alzheimer’s disease. One of the noteworthy observations not reported in the previous article is that despite the remarkable deterioration in the ability to perform personal daily activities, the artist insisted on continuing to paint as if painting was the only task that he could concentrate on and was the only driving force of existence. This phenomenon, also observed in the case presented by Crutch et al. , may reflect that the brain region controlling motivation and artistic drive is unaffected and may offer a testament to the resilience of artistic creativity. Though, it could also partially due to the pathology of prefrontal cortex which may lead to disruption of the frontostriatal pathways resulting in restricted interests and repetitive behaviors such as those shown in some other neuropsychiatric disorders including frontotemporal dementia. The authors have no potential conflicts of interest to declare and no financial support to disclose. Lee YT, Tsai YC, Chen LK. Progressive changes in artistic performance of a Chinese master with Alzheimer's disease. Cortex69(1), 282-283 (2015). Cummings JL, Zarit JM. Probable Alzheimer's disease in an artist. JAMA258(19), 2731-2734. Espinel CH. de Kooning's late colours and forms: dementia, creativity, and the healing power of art. Lancet 347(9008), 1096-1098 (1996). Crutch SJ, Isaacs R, Rossor MN. 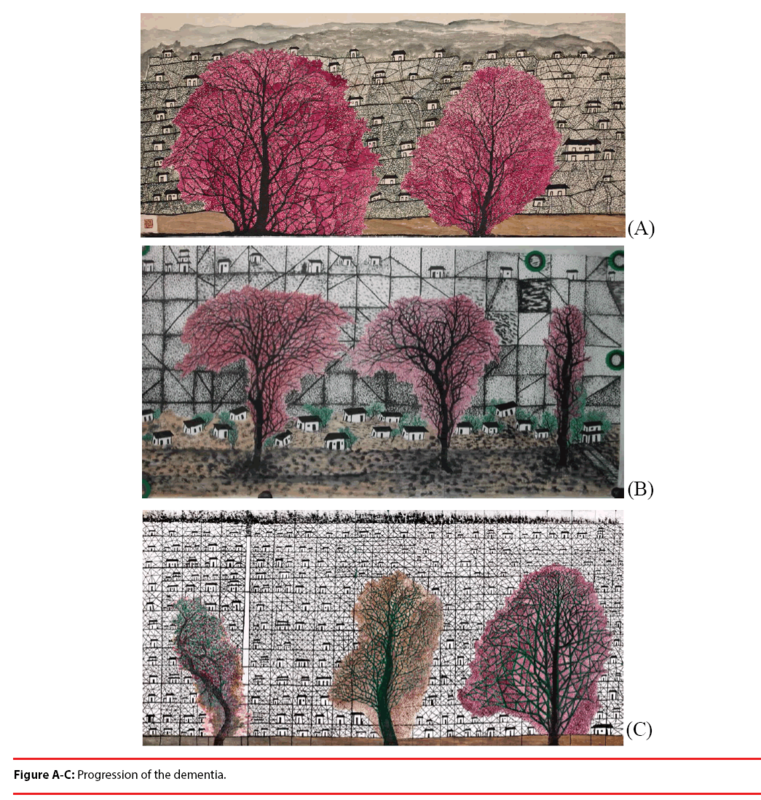 Some workmen can blame their tools: artistic change in an individual with Alzheimer's disease. Lancet357(9274), 2129-2133 (2001). Maurer K, Prvulovic D. Paintings of an artist with Alzheimer's disease: visuoconstructural deficits during dementia. J. Neural. Transm (Vienna)111(3), 235-245 (2004). Fornazzari LR. Preserved painting creativity in an artist with Alzheimer's disease. Eur. J. Neurol12(6), 419-424 (2005).